Levels of public subsidy and private investment will vary greatly between and even within different countries for the foreseeable future, but those that find the right balance stand to gain economically and can significantly improve living conditions fro their citizens. Renewable energy can have wide-ranging social and economic benefits for developing countries, as well as contributing to the climate change agenda. But a balance needs to be struck between public subsidies, the charity sector and private investment. The majority of Kenya's rural families survive by rearing livestock and cultivating crops, so it's little surprise that only 15% of the population has access to the national electricity grid. As a result, the country's poorest citizens are forced to burn wood fuels which can lead to severe health problems and are seriously depleting the country's forests. It is these people who stand to benefit most from Kenya's National Domestic Biogas Programme (KENDBIP), set up in November 2009, which aims to install 8,000 bio-digester plants across the country over the next four years. The technology uses farm waste to generate energy for cooking and lighting, but also produces a slurry by-product that can be used to improve soil fertility. As well as contributing to the climate change agenda, sustainable programmes such as KENDBIP can be a driver of economic and social development and enable poor communities to become self reliant. Bioenergy is a particularly popular option because the raw materials – often cow dung – are cheap and easily available. “The benefits of this technology cannot be overstated,” says George Nyamu, National Coordinator of KENDBIP, which is part of a larger African biogas partnership aiming to provide renewable energy to 10 million people in 6 African countries by 2015. KENDBIP is subsidised by the Dutch Government through the NGO Hivos. This aims to bring down the cost of constructing the plants – one of the biggest barriers towards the development of renewable energy in Kenya is the high price of labour and materials, combined with long distances between dispersed settlements and undeveloped rural transport infrastructure. KENDBIP's ultimate goal is to develop a commercially viable biogas sector in Kenya by bringing in the private sector, says Nyamu. But current subsidies only meet about a quarter of the total plant cost and the scheme needs more public funding to make the biodigesters truly affordable for the poorest families. There are a number of other serious barriers to the development of Kenya's energy sector such as poor construction and management, inadequate post-installation support, training and maintenance, low standards and a scarcity of good building materials. There is also low public understanding of what the technology does and little money available for running promotional campaigns. As well as financially supporting sustainability projects, Nyamu strongly believes his Government has a crucial role to play in developing and enforcing energy policies and regulations. Mirjam van Reisen, Director and Founder of Europe External Policy Advisors (EEPA) and author of a recent report on Sustainable Energy in Developing Countries published by Hivos, argues that the EU also has a legal obligation to promote sustainable energy under the Lisbon Treaty objective to eradicate poverty. Her research examined the prominence of energy policy in the EU's country strategy papers (CSPs) of 99 developing nations ahead of the mid-term reviews taking place this year. 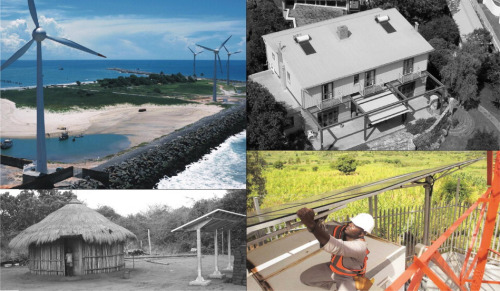 According to the report, only 15 strategies – including Trinidad and Tobago and Guinea Bissau – define sustainable energy as a focal or non-focal sector. Latin American countries in general barely mention renewable energy but the Pacific Islands, by contrast, have a well-developed sustainability policy that includes renewables. “It is surprising that so few countries (and such small countries) have sustainable energy at the core of their programmes for poverty eradication with the EU,” says van Reisen. “If women in rural areas living in poverty have sustainable energy for cooking it will save them and their daughters many hours of walking. Van Reisen's report calls on the EU to allocate more funding to sustainable energy and implement a more structural energy policy for developing countries. She says the EU's multi-annual budgeting is crucial for predictable aid flows on which developing countries depend. Van Reisen says there needs to be recognition that the private sector cannot achieve everything alone. “Sustainable energy programmes are good for small- and medium-sized businesses and therefore are excellent as engines for economic growth in poor areas. However, to reach people in extreme poverty we have to understand that market mechanisms can only be built with subsidies and grants, because in very poor rural areas the market is not sufficiently developed. Van Reisen's report calls on the EU to allocate more funding to sustainable energy and implement a more structural energy policy for developing countries. In June, Kandeh Yumkella, Director-General of United Nations Industrial Development Organisation (UNIDO), admitted that current energy systems were failing to meet the needs of the world's poor. He said technology transfer was a key element of global efforts to improve energy efficiency and mitigate climate change. Saroj Rai, Executive Director of Nepal's Biogas Sector Partnership (BSP), agrees that a balance needs to be struck between the vested interests of private investment and government funding, which can have a limited lifespan. BSP has been funded by the Dutch Government since 1992, and since 1997 the German and Nepali Governments have also contributed financially. 10%-20% of the budget is generated from the Kyoto Protocol's Clean Development Mechanism (CDM); it is currently the only CDM-funded project in Nepal although more are in the pipeline. But funding from the Netherlands will end this year, leaving the programme in a precarious position. Rai is optimistic, however, and says some of the biggest obstacles to the development of renewables in Nepal have already been overcome. These included creating proper institutions in the Government and private sectors as well as among NGOs and community groups; minimum policies; guidelines and technical standards; and minimum local technical and managerial capacity. The current challenges, he says, are to reach the country's remotest areas and make these market-driven programmes more inclusive, to fund larger projects and to increase involvement of the local government and other local stakeholders in designing and implementing projects. Rai believes the EU has a temporary role to play in providing funding and in helping developing countries develop good policies and programmes to strengthen their institutions and scale-up current projects. But he insists that such support cannot go on indefinitely. 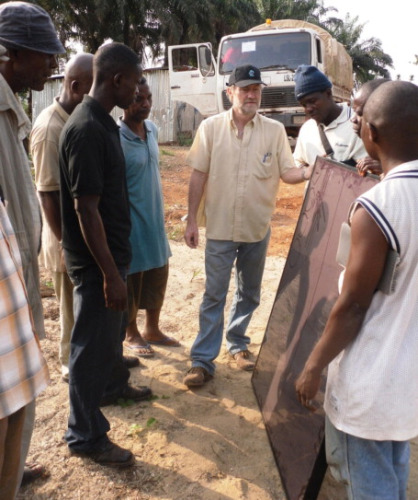 Naps Systems, a Finnish solar energy company, has been trading in Africa for many years. Timo Rosenlöf, President and CEO, says his company has been able to do business in a challenging environment such as Africa because it is part of a large corporation and has the necessary funding available. But not all companies have access to such resources. "Unsubsidised private markets can only be created by promoting micro-financing models..."
The problem is that many developing countries have an unstable financial and political climate. The good news, according to Professor Dieter Holm, President of the International Solar Energy Society (ISES) Africa, is that private enterprise can have a positive effect on the economies of developing countries. He says that solar thermal and solar electrical businesses, for example, have a large growth rate and employment ratio during poor financial periods. Levels of public subsidy and private investment will vary greatly between and even within different countries for the foreseeable future, but those that find the right balance stand to gain economically and can significantly improve living conditions for their citizens. “Some countries are using the economic crisis to stimulate innovation in order to revitalise and diversify the economy and guarantee future growth and wealth creation. The challenges of energy security, climate change and energy access can all be partially addressed through renewable energy technologies,” says Yumkella of UNIDO. Policymakers in the world's major developing countries are achieving mixed results in their efforts to stimulate clean energy investment, the Carbon Disclosure Project (CDP) has found. The research was commissioned by the Renewable Energy and Efficiency Partnership (REEEP) to identify corporate best practices in promoting energy efficiency measures and the use and development of renewable energy in Brazil, China, India and South Africa – known as the BASIC countries. The report maps the extent to which corporations in BASIC countries are investing in these areas, investigates the drivers of this investment and specifically evaluates how national government policy affects private investment and what lessons can be learned from national approaches to policy. One intriguing finding from the report is that while the impact of policy on investment decisions can vary depending on national circumstances, companies consistently state that their own internal policies are crucial to investment decisions. This may suggest that companies from the large emerging economies are operating in a global market place where their operating environment is shaped not only by government requirements but also by the expectations of customers and competitors. What were the specific country findings? Strong regulatory requirements for the energy sector are having an effect on corporate investment. Companies would also like to see good performance recognised, such as through a corporate energy efficiency index or individual efficiency contracts with government. Biofuels policy and the CDM have encouraged investment by companies in Brazil. The cost of investment in renewable energy can be high, and many policy suggestions made by companies are focused on bringing down the cost of renewable power generation i.e. through a special tariff, renewable energy credits, or reduced transmission costs for smaller renewable energy generators. Companies expect to see new renewable energy policy measures resulting from Brazil's National Action Plan on Climate Change. High-level policy signals have been effective in stimulating investment. However there is an appetite for more specific regulation which applies to a larger number of companies. Green finance measures have been effective in shifting investment flows at a large scale and, as in Brazil, companies would like to see measures that provide incentives or recognition for good energy efficiency performance. National policy on renewable energy has provided a clear signal to companies and has stimulated investment. The CDM has acted as a spur to corporate investment, both directly (i.e. for project development) and indirectly (i.e. new business areas for service companies). Companies would like to see innovation in energy market structure and demand management i.e. a renewable energy generation obligation, a renewable energy or emissions trading market, and generation-based subsidies. Regulation is a strong driver of corporate energy efficiency investment, and companies expect to see new measures resulting from the National Enhanced Energy Efficiency Mission. The CDM also plays an important role in driving investment for some companies. Companies would like to see Government create more energy efficiency standards and product efficiency ratings. Regulation plays a particularly strong role as a driver for investment in this area, and companies expect to see new measures resulting from the National Solar Mission. Investments are being made by a wide range of industrial sectors, and not only by the power generation sector. Companies would like to see more government support for the full range of the technology cycle, including research and development (R&D) support, capital subsidies, generation incentives and standards. Energy efficiency is a high priority for South African companies, and energy security and cost reduction are key drivers for this. The voluntary Energy Efficiency Accord appears to have worked well in setting expectations for corporate behaviour but may have been insuffi ciently ambitious. Companies are making preparations for the emergence of a new energy efficiency tax incentive and for the proposed Power Conservation Program. Some companies anticipate that the Renewable Energy Feed-in Tariff (REFIT) generation incentives will change their investment patterns, however there is uncertainty about how this regulation will be applied. The CDM is an important driver for investment by some companies. Companies would like to see R&D support; simplification of planning consents; renewable energy targets; and in-country support for CDM project development. Technology-specific measures are not favoured. Anumakonda's comments are just as relevent to, so called, Developed countries as well. Unless we embrace sustainable technologies and practices worldwide across all borders and cultures we are in for a very difficult future. Excellent post. Renewables are best suited for developing countries. Solar Water Heaters,Solar Driers, Solar Disinfection for providing safe drinking water, solar PV,Wind Turbines for Power generation,Wind Battery Chargers,Biomass,Microhydro systems --- all benefit developing countries in supplementing energy needs. Subsidies are needed in the beginning to promote the concept but subsidies alone won't make a Renewable Energy Program successful. The moment subsidy comes into picture many a time quality suffers. In India Experience shows Solar Cookers, Smokeless Chulahs,Water Pumping Wind mills were not successful even though subsidies were provided(In the case of Water Pumping Wind mills,supplied free). They were more for target rather than progress. When quality and reliability and user needs are met,people won't mind purchasing Renewable Energy gadgets even without subsidies. For example bicycles which were never subsidised are in use in millions even though they cost double than a solar cooker.Nobody uses useless things.